Adding or upgrading trim is a great way to update and improve an old house. But what about all those weird and wonky angles? Here’s how to figure out those angles for trim with items you already have handy in your home. In this house, there’s only one master of moldings, and that’s Chris. We have all kinds of wonky walls and so many different angles for trim going on in almost every room and Chris has always seemed to be able to get everything to fit just right, no matter what. I hardly ever have holes or gaps to fill. Really, it’s ridiculous. I’ve never quite understood how he was able to get things so perfect like he does, especially when he’ll measure out a section of wall in a bedroom upstairs and then he’ll go aaaalll the way downstairs and outside to the garage to do the cutting. When you’ve got angles that are 90 degrees, or even 45 degrees, everything’s all easy-peasy, but what are you supposed to do with the walls in these weird old houses? Get out the protractor? Ain’t nobody got time for that! It involves an old pizza box, and scissors, and that’s it. He just takes a piece of cardboard and trims it down until it fits right into the section of wall he’s working on, and then he has a perfect template that he can use to line up his saw and see if the two pieces of molding that he just cut line up the way they should. All that without having to go all the way back up and down those steep steps a million times to test if everything fits just right. So that’s it! Hope you find this little trick helpful! I know we’ll be using it a lot more in the near future trying to figure out all the angles for trim in this house! DIY Stock Book Shelf Update with Beadboard! Outdoor Living DIY: Rustic Barn Wood Beverage Center! That is very smart… I’ve seen plenty of hacked up moldings in my day! Thanks for the tip! You are a genius…..I’l definitely saving this for my next crown molding project in our old house! Haha! Thanks, LB! It’s all Chris’ genius here, but I’ll happily take the credit! That IS easy and so awesome!!! Super smart, I love it! That is so extremely clever! Oh, my goodness! I’m pinning this for sure. ( I found this on Pinterest). Thanks, Anna! The simplest ideas are usually the best ones, aren’t they? And my husband laughed at me when I made my templates from 3×5 cards. I would laugh but living in a house built in 1926 I have been doing this for years. SO much easier! No worries, Jenny. 🙂 It’s just as straightforward as it seems. The idea is that it’s much easier to fiddle with a piece of cardboard and scissors to try to trim it by eye and get things just right until it fits perfectly, rather than using a saw and your piece of trim and running back and forth to your workshop between every cut. It’s one of those ideas that’s so simple you wonder how it was never obvious to you before! Thanks so much for this great idea! This works even better if you have two pieces of cardboard and some tape. Hold the two pieces overlapping one another, spreading them so each one has an edge against the wall (or whatever you are trying to fit up to). Make sure they come to a point if it is in a corner. Once the two pieces together fit the shape to be matched, tape them together, and now you have a template for cutting both edges to make the correct angle. Works great when fitting a piece of carpet into an oddly shaped space, too. Just use larger sheets of paper and move the pieces so all straight edges are matched along the edge, tape all pieces together to form the pattern. Now your starting to think like a pro! Julia, that’s how it’s really done. Short & sweet!! I love it! I did this to make a closet in an odd-shaped room a couple years ago… but for some reason, I didn’t even think of doing it for molding. I was worrying all about the joining angles too after I read your trick, but then Julia came in with the simplest of ideas. You guys are fabulous! 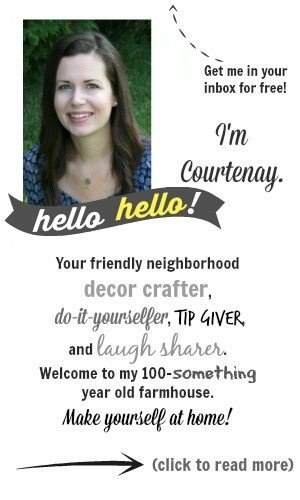 Have an old farmstyle home with barn style ceilings and this cardboard cut out is a FAB idea…thank you thank you . Used much the same principle when I layed out the linoleum for a downstairs bathroom a few years ago. I used newspaper and taped over the pieces to get the outline and dimensions right the first time. But a great idea nonetheless. You can take this great idea one step further to set the correct angle on your miter saw. I use paper to get the shape of the corner. Then I fold it in half, with the “wall” edges of the paper lined up with each other. Then place the paper on the miter saw with “wall” edge against the saw fence, and adjust the angle for your cut to match the folded edge of you template. I cut several tile size sheets from newspaper when I tiled my small bathroom floor. Just laid the newspaper “tile” in the next space to be tiled and made indentation on paper where cutting line for tile would be. Then traced onto tile to be cut to shape needed. Tile job turned out great for never having done tiling before. I love it! Sometimes the simplest ideas are the best ones! Thanks for sharing, Phyllis! Great idea! We have also struggled to get the angles just right and were afraid to ruin valuable trim but now you have given us the secret weapon! Thanks so much. I just use a $3 bevel gauge it’s much quicker than cutting bits of cardboard and it’s always in your toolbox. Great tip! We have issues with some of the older, existing moldings in our house shrinking in the dry winter air in our house every year! Fantastic tip and thank Chris for this as I have need to do this shortly. Quick question, how come we never get to see Chris’ face, is he shy? All of us out here are very impressed with the projects he does. Actually, many of us are probably quite envious! I’d be in shock if my husband picked up a tool, well I’d probably break something racing over to remove it as he is dangerous. You are so very lucky so make sure he knows how impressed all of us out here are! As always, love your tips and adding to my growing collection. Now if I just had your energy! Trying the sweet potatoes tomorrow. This is way too easy . . . ! Gotta make it look hard . . .
Aw, thanks so much, Mary! You made our day! We’ll make sure that Chris shows up in our posts a little more often. He works on just about every project with me in one way or another these days… I’ve even got him helping me in the kitchen every once in awhile, which is a BIG deal, trust me. 🙂 Thanks so much for your kind words! Hope you love the sweet potatoes! There are a lot of incompetent “carpenters” out there that ought to know this, but they don’t. There is an adage in carpentry……..lots of caulking and paint make a carpenter what he ain’t. Just an FIY & take on the same principal that Chris uses….There’s a YouTube video that shows a master carpenter who basically threw out His angle finder & crown molding protractor in lieu of a roll of paper drywall joint tape to figure out angles.A link is easy to find by typing “How to measure for crown molding without tools” But basically,The idea is cut 2 strips of joint tape & place on each wall,Overlapping to make a templet of the corner the fold the tape in half to find the bisected angle & match that measurement to the angles of Your miter saw.This would work for straight ceilings but I doubt vaulted ceilings. Wow! Thanks so much for sharing, Melissa! I think when it comes down to it, a lot of the pros really do prefer to come up with their own methods for a lot of things. A lot of building/carpentry is about coming up with solutions as you go along, and this just proves it!